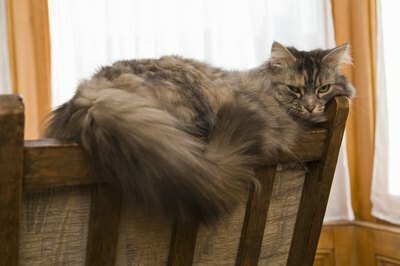 Long-haired cats can hide spay surgery scars under lots of fur. Adding a female cat to the household comes with responsibilities -- one of which is spaying. This involves surgically removing the ovaries and uterus, which keeps her from going into heat or getting pregnant. If the cat is an adult, you can learn if she has been spayed several ways. Hold the cat in the crook of your arm, belly up, like a baby. Rub her belly and talk soothingly in a calm voice if she seems apprehensive. Gently part the hair on her belly and look for a scar; a spay surgery will leave a scar that should remain for a few years. If the cat is older, it may have healed over. It may be difficult to find a scar on a long-haired cat. Look for shaved or short belly hair if the cat has been recently acquired. Spay surgery requires that the skin be shaved clean, and it will take some time for the hair to grow back. Check your cat's ears or abdomen for a tattoo. An "M", for instance, means the cat carries a microchip in its body from a previous owner. Other tattoos and markings -- such as a "tipped" or clipped ear -- can indicate the cat has been spayed; call your vet to inquire about a tattoo's meaning if it is not obvious. If the cat has a microchip implanted -- usually between the shoulder blades -- the identification number transmitted can lead you back to the original owner. Even if he or she no longer wants the cat or cannot keep it, you can be advised if the cat was spayed. Wait an extended period of time to see if the cat goes into heat. Signs include moodiness, yowling to attract a male's attention, extreme affection with everyone that comes into the home, spraying walls or floors with urine, or a discharge. While cats can breed at any time of the year, heat cycles are frequent -- as often as every few weeks -- especially during warmer months. So you won't have to wait long to find out if your cat's hormones are still working. Schedule a checkup for your cat with your veterinarian, who can verify whether the cat is spayed and in good health. An initial exam is important if you have other cats in the household, to protect them from parasites or diseases that stray cats can bring into the home. Animal Planet: Cat Health 101 -- How Do You Know if Your Cat is in Heat? Do All Vets Tattoo Spayed Kittens? What Would Cause a Cat to Become Impacted?